How this unknown, unsigned studio project helmed by Atlanta resident Eric Guenther secured the production talents of Daath's Eyal Levi and journeyman drummer Kevin Talley (Dying Fetus, The Red Chord, Black Dahlia Murder, Decrepit Birth) is anyone's guess. So here's my guess: the band's talent is too obvious and massive to be ignored by anyone that hears 'em, labels be damned. Listen here for prog-metal without pretense, a huge album that packs a two-disc Dream Theater album's worth of musical fireworks and superior writing into its meager 32 minutes. 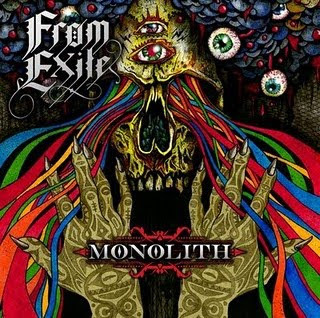 To put it in the feminine hygiene product vernacular, Monolith is a "heavy flow" kind of album. Less a collection of songs than a continuous suite of big bang music, most of Monolith sweeps across the shred-to-stomp continuum with plenty of luxurious solos from Levi and his Daath bandmate Emil Werstler for the rubbernecking (ed. - each of them contribute just one solo, though all the lead guitarwork is first-rate). There's fleet melodic death riffage that'll leave the soul julienned and imperial marches that mimic planet formation. Processed melodic vocals are tacked on to a few tracks as afterthoughts, and they're the only letdown here (only album I've heard that work the semi-robot vox well is Cynic's Traced In Air). Otherwise Monolith is a totally inspired, cohesive work, and proof that not all progressive metal has to be over-the-top in concept or execution to instill me with pride in my long-haired, scale-savvy brethren. Nice review - I've been waiting for someone else's take on Monolith. This is a great album, it deserves some attention. The sound is quite surprising in this day and age; it's progressive without the provolone. I find myself going back to it a lot.